Join the Pacific Northwest's premier Mystery Theatre Company on Friday, January 29 for a highly interactive dinner evening full of improvisational comedy. Beginning at 7:30 p.m. at Chambers Creek Regional Park, an outrageous cast of hilarious actors will interact with you as they pull you into the mix. A detective leads the investigation helping you solve the mystery for prizes. Fee is $54/adult (ages 21 and older). Fee includes gourmet dinner and entertainment. Pre-register by January 20 on-line or (253)798-4141. Kick off the New Year in a fun, healthy way. Run through 3.1 miles of scenic woods at our “No Sun Fun Run” on Saturday, January 30 at 10 a.m. on the Nathan Chapman Memorial Trail in South Hill Puyallup. Rain, hail, sleet or snow, the “No Sun Fun Run” will take place no matter what weather our South Sound provides. Pre-register for a reduced fee by January 13. Come dressed warm and bring your enthusiasm for one of the first 5K's of the year. Remember, there's no such thing as bad weather, only bad clothes. Visit our website to register or more information. All princess are invited to the Environmental Services Building in University Place for an enchanted party on Friday, January 22 from 7-9 p.m. This magical event includes dancing, crafts, a majestic parade, meeting your favorite princess from Emerald Kingdom Parties, and refreshments. Participants are encouraged to wear their “royal princess” attire. The cost is $13 per child pre-registered by January 19. Join us for the first Family Movie Night of the New Year. Families are invited to attend a FREE viewing of ‘Minions’ January 22 at the Lakewood Community Center. This movie begins at 7 p.m. Doors will open at 5:30 p.m. and families are encouraged to bring blankets and pillows to accompany the show. Visit our website for directions. Ice skating lessons for all ages and levels! Sprinker Recreation Center’s Learn-to-Skate program is the best beginning ice skating program for both the recreational and competitive skater. 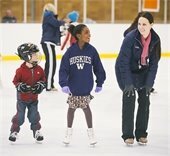 This fun and safe program is for skaters ages three to adult, beginner to advanced level figure skaters, and hockey skating skills. Classes are taught by an elite staff which include former show skaters and competitors. For more information on group classes, call Sprinker Ice Arena at (253)798-4000. When you think of fun runs you think of South Sound Running! They are one of Pierce County Parks & Recreations signature sponsors for the multiple fun runs held throughout the year. Greg Klein has been an amazing supporter of the department by providing bibs, bags and prizes for over 8 years now! On top of these amazing items he always donates multiple pairs of shoes to be used as prizes and giveaways. Who doesn’t want to win a free pair of running shoes? His support of the runs goes beyond the items he provides. He is always willing to help out with by spreading the word to the running groups as well as post marketing materials in his stores. A BIG thank you to South Sound Running and Greg Klein for your continued support of Pierce County Parks & Recreation. You rock!